Sea Pink01263 715779work01603 870304fax Self-cateringThis comfortable apartment has everything you need for two people to enjoy a romantic break beside the sea. All the facilities offered by Wells are only a short walk away. This is a wonderful base from which to explore the rest of the stunning North Norfolk coastline and villages if you so desire and especially convenient as you have a parking space - like gold dust in Wells! Wells-next-the-Sea is a very popular seaside town, with great transport links. Outdoors: Fully enclosed decked courtyard, table and chairs. This comfortable apartment has everything you need for two people to enjoy a romantic break beside the sea. All the facilities offered by Wells are only a short walk away. 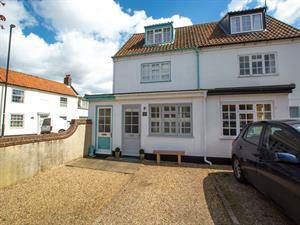 This is a wonderful base from which to explore the rest of the stunning North Norfolk coastline and villages if you so desire and especially convenient as you have a parking space - like gold dust in Wells!